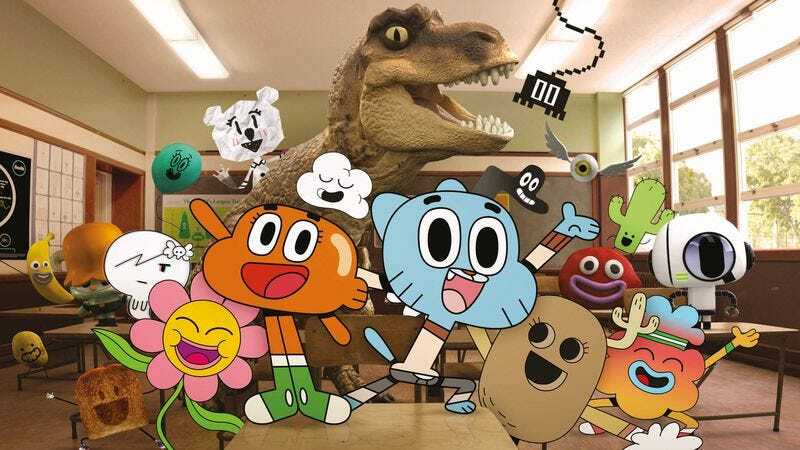 As reported by The L.A. Times, the hit Cartoon Network show The Amazing World Of Gumball is going to get a full-length graphic novel side-story. The show focuses on Gumball (a little cat boy), his sister Anais (a rabbit), and his adopted brother Darwin (a goldfish), and the comic will tell a story about Gumball visiting a Renaissance fair and accidentally angering a magician who then turns Gumball’s hometown—”the fictional city of Elmore,” as The L.A. Times helpfully points out—into an actual fairytale world. The book is being written and illustrated by Megan Brennan and Katy Farina, respectively, and it will reportedly embrace the show’s tendency to mix normal 2D animation with computer-generated characters. Farina also notes that there will be “some gags that take advantage of the comics medium” as well. The graphic novel, which is titled The Amazing World Of Gumball Vol. 1: Fairy Tale Trouble, will be in stores this November.